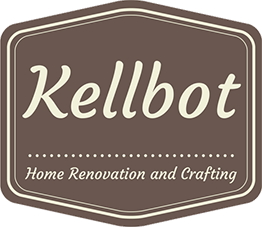 Weekend projects - Kellbot! | Kellbot! We had our first free weekend in a while so we took some time to tackle stuff around the house. First, we cleaned out the garage and washed the car! I don’t have a picture of that, because I am a bad blogger. Also, I was busy washing the car. Immediately after we finished washing it, a pop up thunderstorm drenched everything in water and we were very happy to have a garage. Then we did our part for the economy and bought every household item imagineable from three different stores. Frames from Michaels, window blinds from Lowes, and everything else in the world from Target. 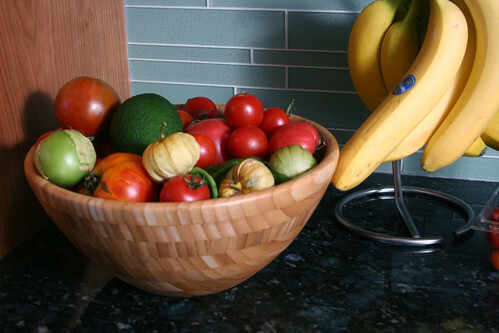 Including this salad bowl, which we’re using to hold our surplus of tomatoes from this week’s CSA harvest. If we get another 6 lbs of tomatoes this week, it’s going to make pasta sauce. Then we hung blinds over the back faux-french doors. I call them faux-french because they look like french doors, but the “door” on the left is actually completely fixed in place. This was more of an ordeal that we expected, because the doors are hollow metal. But we made it work. It’s surprising how much of an effect they have on the room. 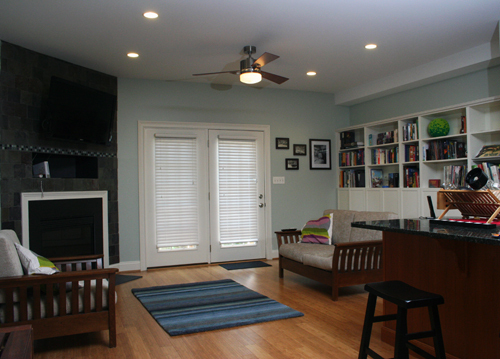 It feels much more like its own space now, rather than an auxiliary space between the kitchen and back yard. We also hung some photos up. After a decade each of living in apartments where we couldn’t really hang things on the walls (or were too lazy to) we’re finally putting up artwork. We even went through the trouble of having mats cut for some of the odd-shaped pieces! The next few weeks will be spent figuring out where everything goes. The reading room was the easiest because it only has one small section of wall. We also spent some time working on the baby’s room, which is at least half done now. The big accomplishment was getting a room darkening shade up, so maybe one of these days she’ll be willing to sleep in past 6am. We can only hope. I made a great tomatillo pesto the other day with the tomatillos we got in our farm share. http://www.athoughtforfood.net/recipe-fettucine-with-tomatillo-and-cilantro-pesto/ I used parsley not cilantro since that is what we had from the farm share and added a banana pepper. Delish with lemon pepper chicken. Wow your place is amazingly clean for having a new baby. How do you manage to do that? We struggle with keeping our place clean. Though now that A it one, he tends to help create some chaos..
It’s all a clever ruse! I clean up before taking photos!